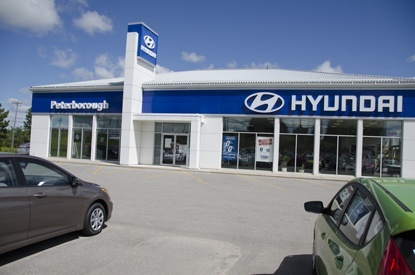 With an Award Winning line up of New Hyundai vehicles and the largest section of pre-owned cars of every make and model Peterborough Hyundai is creating new satisfied customers everyday . . .
"Great service. Larry is a gem. Love dealing here." Philip F.
"I drive a 2007 Santa FE AWD purchased new at this dealership. I have absolutely no complaints, either with the vehicle or service for this vehicle. Indeed, the service department presents as courteous, competent and efficient. Thank you Hyundai for trouble free driving." Dave M.
"I have been pleased with the service that I have received when my Santa Fe is in for oil changes etc. Any questions that I have are answered fully and quickly. Joe Doran was particularly helpful and professional as a salesman. He made our car purchasing experience a pleasant one." David W.
"Always polite and happy. Great service always. Sales staff always says hello. Not pushy. Very happy with vehicle." Lynn O.